Imagine Joshua Slocum as a patient tutor and Martha Stewart preparing delicious meals on deck, and you have the beginnings of an appreciation for shipping out on the Samana. That’s what one of the email testimonials said when I checked out the Web site for The School of Ocean Sailing as I searched for the “sailing school to meet my needs”. I was introduced to sailing by my husband a few months before we married 10 years ago. Each of us survived divorces and was eager to develop a new and better life. Fortunately, Ken had sailed for years, so a better life included the purchase of a 25-foot Columbia. After a few years, we bought a 30-foot Baba and made serious plans to move aboard. As we sold our house and spent a summer preparing for living aboard, it occurred to us that, while Ken had obtained his bareboat certificate via a sailing course on the Great Lakes, I had never attended any formal sailing school. We decided it would be prudent for me to develop my navigation skills. Ken encouraged me to take a course simply to bolster my confidence. Since the purpose of this instruction was to prepare me for coastal cruising along the Atlantic seaboard, it seemed appropriate to consider courses set on the coast. On the Internet I found a long list of sailing schools offering a bewildering array of course schedules and levels of instruction. Some were ASA-certified courses, meaning their content was approved by the American Sailing Association. Most of the sailing schools offered day instruction only, with three- to seven-day courses available. Only a few offered live-aboard courses, and they were relatively expensive. I whittled the list down to a handful of schools offering live-aboard classes focused on coastal cruising. One sailing school stood out from the rest: The School of Ocean Sailing in Portland, Maine. Their Web site http:// www.sailingschool.com was well organized and provided information on the course offerings, instructors, and daily schedule. I learned that the school has been in operation since 1975. Students live aboard the Samana, a 52-foot steel ketch. Larry Wheeler is the captain and a Coast Guard-licensed merchant marine officer holding a 100-ton sail auxiliary and unlimited radar endorsements. He retired not long ago after more than 20 years as a mathematician and professional teacher. His wife, Letty, is a Dutch citizen and experienced sailor who came to the U.S. in 1972. Together, they offer classes in ocean sailing, advanced coastal navigation, and celestial navigation. They also offer an introduction to offshore passage making. Larry and Letty are both certified by the National Association of Sail Instructors and Sailing Schools (NASISS). I read about the skills taught in each course and the landfalls for each passage. 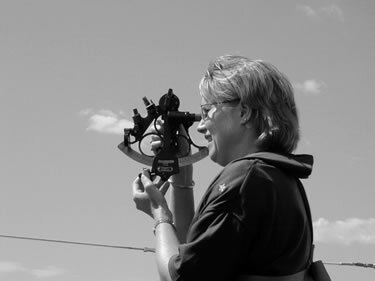 Some of the skills included in the coastal navigation class were coastal piloting, dead reckoning, sail handling, reaching, running, tacking, and docking techniques, along with using radar, GPS, electronic chart plotting, weatherfax, and single-sideband equipment. The class size appealed to me: six students with two instructors. Two things really cinched the decision. First, the course focuses on preparing students for navigating through fog (with fog likely during the training). I reasoned that real-life instruction navigating along the rocky coast of Maine in fog with 15-foot tides would be far more useful to me than a sunny Florida setting. The second clincher was Letty’s cooking. The menu for the week is posted on the Web site: ginger chicken over basmati rice, vegetable lasagna, chicken &agrave; l’orange. Sailing instruction and gourmet cuisine as well? I was hooked. Accommodations aboard were included in the price, which was under $1,000, so I sent my check to reserve a spot on Samana for the first week of August.